With a sea of red flags marching in the streets of various cities across the country, workers from various sectors are coming together to fight for their rights, while farmers and agricultural workers along with students and youth stand in solidarity with the striking workers. On the first day of the two-day nationwide strike, history is being scripted by the working class of the country. The strike will continue tomorrow, January 9, with more and more from the organised and unorganised sectors, are expected to pour in. The strike had a significant impact in Kerala, Odisha, Tamil Nadu, Bihar, Assam, West Bengal, Delhi and adjacent industrial areas of UP, Karnataka, Chhattisgarh, Puducherry, Goa and Maharashtra while it was partially successful in AP, Telangana, Jharkhand, and in several sectors across Punjab, Haryana, UP, Rajasthan and Madhya Pradesh. Protest demonstrations and strike was observed in Jammu and Kashmir too. With farmers’ organisations joining in, rural areas witnessed highway blockades and rail blockades at several points. In almost all major cities including state capitals as well as Delhi, striking workers and employees held protest marches and public meetings. Trade unions and federations from various sectors – including banking, insurance, coal and non-coal mines, petroleum, post, telecom, engineering, manufacturing, steel, defence, health, scheme workers including Anganwadi, ASHA and Mid-day meal workers, education, water management, power, road transport, central and state government employees and auto-taxi unions are actively taking part in the nationwide strike. Even the IT employees in Bengaluru and Reserve Bank of India employees have joined with the striking workers. The two-day nationwide strike called by 10 central trade unions witnessed crores of people marking their presence as the first day concluded. 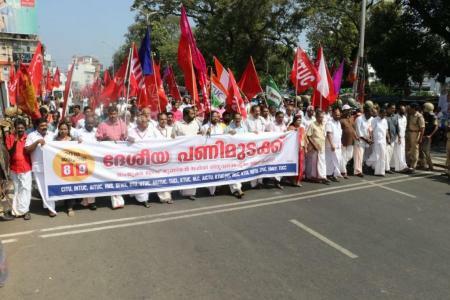 According to central trade unions (CTU),more than 20 crore people are expected to take part in the strike against the anti-labour, anti-people and anti-national policies of the BJP-led NDA government over the two days. It is only for the second time since India became independent that a two-day nationwide strike is taking place, the first one being on February 20-21, 2013. The strike was near total in Kerala on Tuesday and has so far been peaceful. Public transportation remained off roads and workers across the state took to streets to demonstrate peacefully for their rights. In various parts of the state including Alappuzha, Thiruvanthapuram and Ernakulam, train services were blocked by the protesters. Workers on their way to the Cochin Export Processing Zone and at the Cochin Port were stopped by the protesters. All university examinations slated for the day have been postponed and educational institutions were also closed. However, private vehicles were seen plying. pilgrims to Sabarimala have also been allowed to proceed from all places. Senior CPI-M Rajya Sabha member and veteran trade union leader Elamaram Kareem told the media that the two day protest was in total in Kerala. “The labourers at all the estates in the state are on strike. This is a protest against the wrong policies of the Centre and it should not be confused to that of a shutdown (hartal),” said Kareem. Apart from Kerala, road transport was seriously affected in most of the states including Karnataka, Bihar, Haryana, Punjab, Uttarakhand etc. In Madhya Pradesh, road transport in 22 districts was seriously affected. Interstate buses could not run in Jammu and Kashmir due to the strike. In Odisha, Maharashtra and Assam, buses and autorickshaws in several cities remained off the roads. The protesting workers also blocked tracks at several railway stations that affected the movement of trains in the states. Besides, many shops and business establishments remained closed at various places in the states. A bandh like situation prevailed in several districts of Karnataka, Assam and the north-eastern states. Reserve Bank of India employees led by the All India Reserve Bank Employees’ Association and All India Reserve Bank Workers’ Federation were also on strike. Strike was near total except in a few banks and total in the insurance sector and BSNL. The two-day nationwide strike received a mixed response in Tamil Nadu on Tuesday, said a senior leader of Labour Progressive Federation (LPF). The response to the strike was positive from the unorganised sector like construction workers and others. “Members of our affiliated unions have not attended duty. Nearly 50 per cent of the bus services in Chennai are not plying. In other cities, about 30-40 per cent buses are on the roads operated by members of the ruling party union,” said LPF General Secretary M. Shanmugam. Rail-blockades in many railway stations and sporadic incidents across West Bengal districts partially hit normal life as the two-day nationwide strike was observed across the state. Train services were disrupted both in Howrah and Sealdah division of the Eastern Railway and also South Eastern Railway. 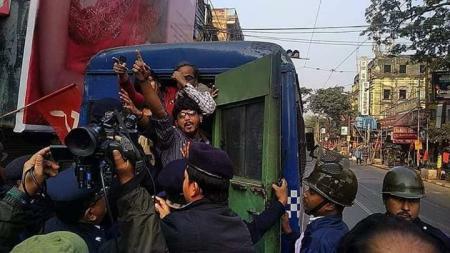 The strike supporters put up rail blockades and clashed with the police in many stations in the suburbs in South 24 Parganas district’s Lakhikantapur and Canning; North 24 Parganas’s Madhyagram, Hasnabad and Barasat. Meanwhile, the TMC-led state government has issued a circular clarifying that its offices would remain open on strike days and no leave would be granted. Over 10,000 police personnel were deployed in the city along with an additional force of 5,000. Tripura has also witnessed a positive response to the strike during the first day. Though the BJP-led government and its party goons tried their maximum, they could not force open more than 30 per cent of shops and run 30 per cent of buses. In the tribal areas of Tripura as well a total bandh was observed. In the industrial areas across the country, including – the industrial areas of NCR Delhi; 24 Parganas, Hooghly and Howrah districts of West Bengal; the oil refineries across Assam; Pune, Nashik and Aurangabad industrial areas in Maharashtra; the industrial areas in Bengaluru, Mysore, etc. in Karnataka; Ludhiana in Punjab; Bokaro, Ranchi, Adityapur Gamharia industrial areas in Jharkhand; the engineering clusters in Baroda, Surat, Bhavnagar, Rajkot, Junagarh and Ahmedabad in Gujarat; and the industrial clusters in Hyderabad and surrounding districts in Telengana, etc.- the strike was highly visible. Workers from multinational companies like BOSCH, CEAT, Crompton, Samsonite in Maharashtra and in all the units of Volvo, Toyota and its subsidiaries in Karnataka have stood along with the striking workers. 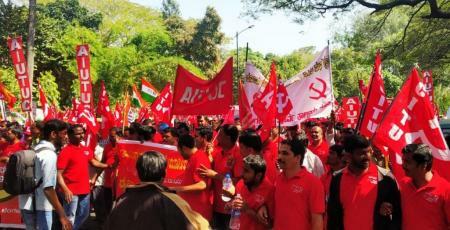 The participation of workers from the Public Sector Undertakings (PSUs) was also massive on the first day. The strike was almost total in Vizag and Salem steel plants and also in all the iron-ore and coal mines under steel industry, including around 50 per cent in Rourkela steel Plant and Bhadravati, and partially in other steel plants. All most every contract worker from most of the PSUs have taken part in the strike. 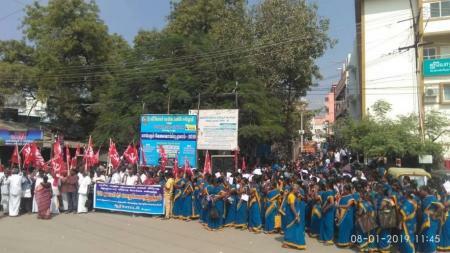 The railway employees who are not the part of strike directly, extended their support in several places. 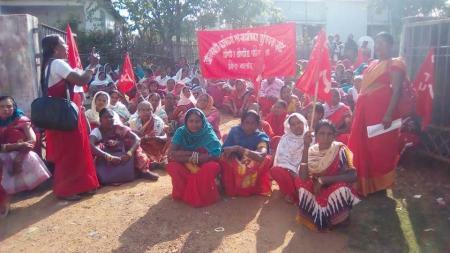 However, the railway contract workers, goods shed workers, and safai karamcharis joined the strike in several states. The tea gardens in Assam, West Bengal and Kerala were totally closed due to the strike. 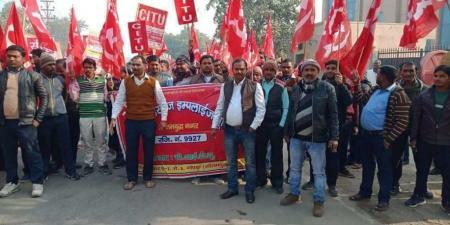 Unorganised sector workers including beedi workers, construction workers, loading and unloading workers, shop employees, private hospital employees, etc., joined the strike in a big way in many states. Clearly, the massive turn out for the strike is a warning from the working class across the country and they will continue the momentum tomorrow, and in the upcoming days.